Using 300 hours of footage shot over three years, this extraordinary and thought-provoking documentary follows a battle-hardened Afghan Brigadier General Sayar and the friendship he develops with an American Colonel enlisted with helping him turn ragtag groups of uncertain, impoverished men into a trained, standing Afghan National Army. This unexpected camaraderie is captured between them despite Sayar s growing exasperation with the US, and their growing friendship reveals the human cost of an impossible policy. The film is an intimate, realistic account of the constant cultural and professional conflicts between the Afghans and the visiting armies. While lack of trust runs strong, stronger are the tight emotional bonds sometimes formed between leaders in the rebuilding of a nation despite political and social barriers. 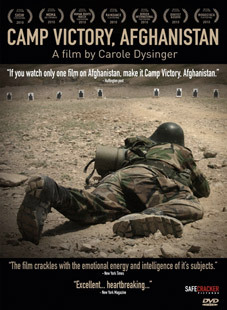 Directed by Carol Dysinger and described as "excellent and thought-provoking" by Variety and "an astounding documentary" by Human Rights Watch, Camp Victory Afghanistan will be released on UK DVD on 15th August 2011 by Safecracker Pictures at the RRP of £17.99. No extra features have been confirmed as yet.